Nobody can dispute the assertion that visual content, say for instance, a YouTube video, can amplify the impact of written content. Welcome to the world of Vlogging and Vloggers. Since the first footage was uploaded on YouTube by its creators, video blogging popularly known as vlogging has come a long way. Given that gazillion videos on YouTube are clamoring for viewers’ attention, you cannot afford to take chances with the quality of video. Simply ensuring that the images are of 4K video or 1080p HD quality will not suffice. You’d need to pay equal attention to the audio quality-viewers who’ve very short attention spans will not wait even for a second before moving on to the next footage if there’s too much of background noise. As the inbuilt mic in the majority of cameras used for filming vlogs are omnidirectional, the quality of audio that is recorded and reproduced is abysmal. Using an external vlogging microphone will enable you to overcome this problem and improve audio quality considerably. Digital gadgets normally used for recording footages like video cameras, DSLRs, camcorders, and action cameras to name a few, come with embedded microphones for picking up audio. Since the primary purpose of a video camera or a camcorder is to record high quality images, the audio captured by the built-in mic is more often than not, of very poor quality. Understandably enough, the inbuilt mic is not the USP of an action or video camera and hence it is not a priority feature. Not only is the audio quality generated by the mic inferior, it seems to pick up almost every kind of sound emitted by different sources eventually overpowering the audio that viewers would want to hear. As long as you’re vlogging indoors, this discrepancy may not make much of a difference. But when you’re recording videos for YouTube out of doors, the background noise and disturbance might drive away your target audience. In order to overcome this problem, your best option would be to go for a good vlogging microphone. Your choice is influenced by the sort of Vlogs you create-Before deciding on selecting the best vlogging microphone that’d be appropriate for you, you’d need to focus on the sort of videos that you generally upload on YouTube. There is a distinct microphone external mic for a specific type of footage. For instance, USB mics come in perfectly handy for filming or recording videos from a desktop PC or via a laptop like a board meeting, interview, podcast, webcast, and so on. There are other types of the microphone for vlogging that are used for capturing a particular kind of footage including shotgun mic, lapel mic, and camera mic. Are you looking for a standard vlogging or a top notch mic? There are different brands or models in each and every category pertaining to microphone for vlogging. Every brand comes with its unique set of features and the versatility of the product usually determines the price. Since the price of a vlogging microphone varies one from one product to another, you budget will ultimately determine whether you can afford a topnotch model or be content with a standard product. After all, you get what you pay for. Accessorial equipment: In order to make the most of your vlogging camera microphone you’ll indispensably need accessorial equipment to vlog including pop filters, tripod stand, shock mount, and carry case to name a few. So, you may have to scale up your budget in order to buy equipment for vlogging (apart from the ext. mic) in case you don’t already have these. Built-in mic in cameras, DSLRs, and smartphones tend to capture ambient noise because they happen to be omnidirectional. On the other hand, the typical microphone for vlogging is either unidirectional (capturing frontal sound) or bidirectional (picking up audio from the back). Though there are some good microphones for vlogging that are omnidirectional, you’ll want to buy one if and only if you wish to include ambient sound in the vlog. 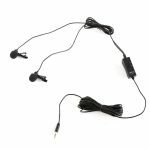 Lavalier/ lapel mics-Lapel mics serve the purpose in coaching classes, tutorials, small conferences, auditoriums, and the like. This kind of mic is popular owing to its small footprint, setting up convenience, and low price. Shotgun mics-Shotgun mics find maximum use in the film and television industry because of their ability to highlight sound in the front by cutting out noise or disturbing sounds on the sides and back. This kind of vlogging camera microphone perfectly compatible for using with DSLRs is preferred by vloggers. Studio mics-As their terminology clearly indicates, studio microphone for vlogging are designed for extensive use across music and song recording studios, radio broadcasting, and TV stations. This type of mic is also in podcasting and webcasting. The quality of audio reproduced is flawless as the studio mic is layered with a specialized material that filters out ambient noise. Generally, a full range of vlogging gear is required for getting the best out of studio microphones. 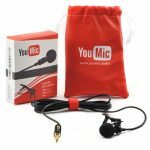 If you want to ensure that the audio quality of your YouTube videos is as good as the images and illustrations, opt for the Lavalier Lapel Mic with Easy Clip on System. Equipped with noise cancellation functionality, the lapel-styled mic from YouMic captures clear and crisp audio making it perfect for vlogging, holding interviews, podcasting or webcasting. Setting up this omnidirectional iPhone vlogging microphone is supremely easy as you’re relieved from the hassle of dealing with messy cables, power plugs, and batteries. This Lavalier mic comes with a versatile 3.5mm TRRS jack that can be smoothly plugged inside the port of an iPhone, iPad, MacBook, MacBook Air, and MacBook Pro or any Android or Windows smartphone. 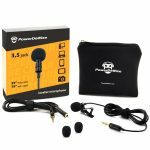 The Lavalier/lapel microphone from PowerDeWise easily qualifies for the best vlog equipment tag in that this device is remarkably resourceful as well as affordable. This is one omnidirectional mic that serves the purpose when you need to record seamless audio for a YouTube vlog, one-to-one interview, podcast, and iPhone webcast. Included in this vlogging starter kit is a 78 inches jack cable that offers you the leeway to move from one position to another while you deliver a lecture or address an audience. The 3.5mm jack at one end of the long cable is suitable for inserting into any Windows and Android-based smartphone as well as any iPhone, iPad, iPod or MacBook. The USB condenser mic from Marantz is one of the best vlogging microphones that you can go for. This Marantz Professional Pod Pack 1 USB condenser microphone with broadcast boom arm exploits cardioid audio recording technology which ensures sound from objects placed closed to each other is picked up flawlessly minus distortions. This vlogging equipment 2017 comes with a boom arm fabricated out of the best grade of steel making it terrifically robust. Suspension springs attached to the arm helps in steady setting up on a tabletop for effective audio capture and playback. 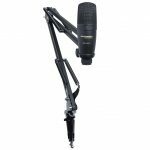 The boom arm can be telescoped in a range of 15.75”-27.5” giving you full freedom to record podcasts or give voiceover dictations. If you’re looking for a good vlogging microphone for making an indie film or recording a family reunion for uploading on YouTube, then you’ll find the SEREE handheld FM wireless eminently handy. This microphone for vlogging has been crafted out of premium metal which makes it heavy duty and has a matte finish for gripping comfortableness. Both the transmitter mic and the receiver have been designed meticulously that facilitates excellent transmittance of sound waves for relaying to the camcorder or GoPro for audio recording. You can speak into the mic within a radius of 65ft from the receiver and the camcorder without compromising on the quality of the recorded audio. The LV20 lapel microphone with dual mics and clips from Movo comes to your aid when you’ve to conduct a job interview, record a podcast for an online conference or voiceover dictation. This Movo mic unit comes with numerous vlogging gear including two sets of transmitters and clips facilitating smooth two-way communication. The slim profiles of the lapel clips and the mics enable the users to easily hide them while recording footage or interacting with an audience. The vlogging microphones are covered with muffing foam for keeping background noise to a minimum. The cord extending to about 6 meters enables free movement while recording voice and the versatile 3.5mm jack can be plugged into the USB port of an action camera or DSLR. With the rising popularity of video logging for uploading on YouTube, creating podcasts or webcasts, demand for vlogging microphones has gone up concomitantly. The market for such ext. mics for use with DSLRs, SLRs, camcorders, and action cameras in order to record quality audio is chock-a-block with lapel mics, shotgun mics and studio mics. Selecting 5 microphones for vlogging was an arduous task. 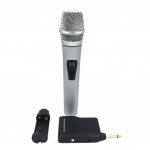 3 lapel mics one each from YouMic, PowerDeWise, and Movo were considered and every model had its own benefits and drawbacks. If you need to choose any one from these 3, go for the Movo mic because of its better reception range and versatility of use. If you’re looking for a mic for across-the-board use, both the Marantz Professional and the SEREE Handheld Mic are equally good, though the former has an edge over the latter owing to its robustness and flexibility of use. Copyright © 2019 Best of Gears. All rights reserved.